Authors: Benjamin R. Safdi, Mariangela Lisanti, Joshua Spitz, and Joseph A. Formaggio. First author’s institution: Princeton University, Princeton, USA. When we look back in time throughout the history of the Universe, the earliest we can see is about 400,000 years after the Big Bang. At that time, the photons started travelling freely through the Universe, and they reach us today as the “Cosmic Microwave Background” (CMB). There has been quite a bit of excitement recently about what the CMB tells us about the properties of the Universe before it was 400,000 years old (see this astrobite). But is there any other way of probing the early Universe? The authors of this paper discuss another time machine: the “Cosmic Neutrino Background” (CνB), a sea of relic neutrinos that were emitted ~1 second after the Big Bang. Neutrinos are very elusive particles, with no electric charge and little mass. This means that they can travel long distances without interacting with other particles. The best way of detecting them is to catch them undergoing a process similar to beta-decay: a relic neutrino interacts with a nucleus to create a daughter nucleus and an electron. Experiments such as KATRIN and PTOLEMY aim to detect relic neutrino interactions with tritium (an isotope of hydrogen with one proton and two neutrons) by looking at the distribution of energies of the out-coming electrons. But what does a “detection” look like? What results should we expect from these experiments? The authors of the paper make predictions of the neutrino detection signal when neutrinos are subject to the gravity of the Sun. The expected detection signal depends on the spatial distribution of relic neutrinos and their velocities. Some analogies can be made to other problems in observational cosmology, specifically to the CMB or to the search for another very elusive particle: dark matter. For example, our Galaxy moves with a certain velocity through space, relative to the CMB. If dark matter surrounds us, we expect to see a “wind” of dark matter particles as the Earth moves about its orbit. Similarly, we expect to experience a wind of neutrinos. The figure below shows the geometry of the problem on the left. On the left, the authors depict the geometry of the problem. The Earth orbits around the Sun, which orbits around the Galactic Center. All of the Galaxy moves with respect to the CνB, creating the illusion of a “neutrino wind”. Two cases are considered: neutrinos can be gravitationally bound or not to the Milky Way. On the right, we see the Earth orbiting the Sun face-on. The effect of the Sun on the incident neutrinos is to gravitationally deflect them and focus them, enhancing their density in some parts of the orbit. When the Earth goes through that region, more detections are expected. Figure 1 of Safdi et al. For direct-detection experiments looking for dark matter particles, the main effect of a dark matter wind is to produce annual modulation of the predicted detection signal. When the particles come towards us, we should see more interactions than when they are moving in our same direction. Here, the analogy breaks. Because the rate of interaction of cosmic neutrinos does not depend on their velocities, the wind does not cause modulation. But there is another source of modulation: the focusing of the neutrinos by the Sun, shown in the right panel of the figure above. Neutrinos approaching the Sun will feel its gravitational pull. As a consequence, the Sun deflects them into a focusing point. As the Earth goes along its orbit, there is a time of the year when it encounters the highest density of neutrinos, closer to the focusing point. The modulation of the neutrino detection signal for bound (solid) and unbound (dashed) neutrinos. The two signals would peak at different times of the year. The amplitude of the modulation depends on the mass of the neutrinos (two masses considered in blue and purple) and on the velocity of bound neutrinos around the Galactic Center (two cases shown in black and orange). Figure 2 of Safdi et al. The figure to the right shows the percent modulation of the signal of neutrinos interacting with the detector throughout the year. The authors study two possibilities for the properties of the wind: neutrinos can be gravitationally bound to the Milky Way, or they can be unbound. 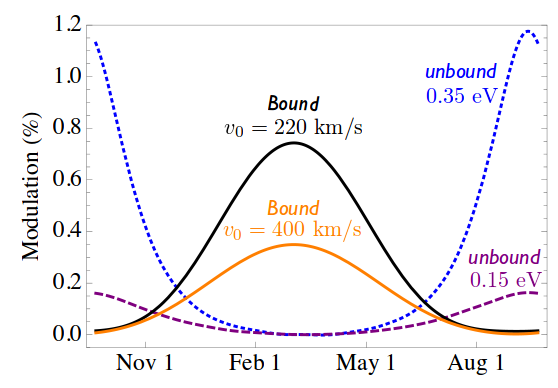 The signal from bound or unbound neutrinos peaks at different times of the year, since they approach the Solar System from different directions. In the case of unbound neutrinos, the modulation is larger for more massive neutrinos. Because those are moving more slowly, they spend more time near the Sun and their trajectories can be easily deflected (blue vs. purple lines). For neutrinos bound to our Galaxy, the efficiency of gravitational focusing, and hence the modulation, depends on their velocity about the Galactic Center. Modulation is larger if neutrinos are moving more slowly around the Galactic Center (black vs. orange lines). Can the neutrino background and its modulation by gravitational focusing be detected? The authors conclude that an experiment like PTOLEMY will be able to measure approximately 10 neutrino interactions per year, allowing for a detection of the CνB, but not its modulation. A detection would provide a confirmation that neutrinos were indeed emitted at the first second, and it would constrain the neutrino mass. The modulation, which carries information on the velocity distribution of neutrinos and also their mass, could be detected only if the density of neutrinos were very high (which some models allow) or if a detector 100 times bigger than PTOLEMY is built. Nevertheless, the prospect of detecting the CνB and going back to the first second is a very exciting one. Please correct your description of tritium. It’s not a molecule made of 3 hydrogen atoms but a hydrogen nuclide with a single proton and two neutrons: quite a different beast.